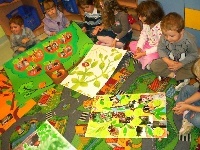 In October, children in Group II with their parents formed a genealogical trees . it was a part of realization of classroom block theme "My Family". finallyall the work became artistic creations of genealogical trees. The trees wre very interesting in terms of technique, some were characterized by rigorous genealogical analysis.